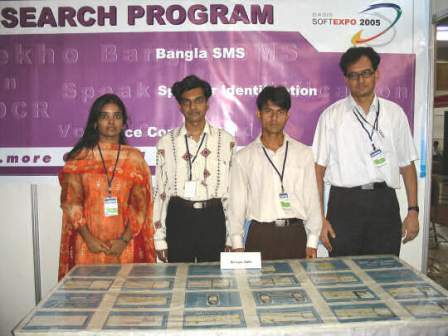 "Bangla SMS" by 3SM Systems has been selected by Bangladesh Association of Software and Information Services (BASIS) along with 5 other projects for participation in BASIS SoftExpo 2005 under IT innovation Search Program (IISP). This mega exposition has taken place from November 27 to December 01, 2005 at the Bangladesh China Friendship Conference Hall, Dhaka. 3SM Systems is a group of four freelance programmers from the Department of Computer Science and Engineering (CSE), BUET. The members of 3SM Systems are: Hasan Shihab Uddin, Sujoy Kumar Chowdhury, Nahid Mahfuza Alam (Shapla), and Md Mahbubur Rahman - currently Level 4 Term 1 students of Department of CSE, BUET.